Mondays always bring the noise, and this Monday is no different. The awesome folks who published my novella Grease Stains, Kismet, and Maternal Wisdom have unleashed their new titles. 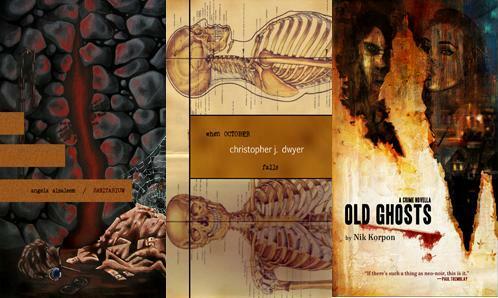 Yes, that's right, Brown Paper Publishing is at it again, this time with Sanitarium by Angela Alsaleem, When October Falls by Christopher J. Dwyer, and Old Ghosts by Nik Korpon. And as always, every paperback title is wildly inexpensive and the PDF versions are available for free. Boo yah. It doesn't get more reader-friendly than that, folks. Check out the catalog HERE. Storybucket 2011. Anonymous readers recommend their favorite online stories. Thanks to Erin Fitzgerald for curating, and congrats to everyone on the list. Thanks also go out to the kindly anonymous person or persons who recommended my stuff. Smokelong Quarterly. Issue 31. Who is this Tracy Gonzalez person? Matchbook Lit Mag. Shane Jones brings Discovery of the Pipe Square. Be safe out there in e-land. You're a good egg, Mel, keep it up. No sweat, Pablo. I'll do up a BPP post over at OWC shortly with the whole kit-n-kaboodle unless Ross beats me to it.